Is it chicken broth, chicken soup or chicken consommé? Photo by Mariuszjbie | Wikimedia Commons. There are different types of soup. 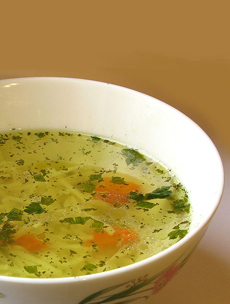 Chicken soup can appear in a form of elegant jellied consomme to the all-American favorite chicken noodle soup. *Thick soups are classified depending upon the type of thickening agent used: purées are vegetable soups thickened with starch; bisques are made from puréed shellfish thickened with cream; cream soups are thickened with béchamel sauce; and veloutés are thickened with eggs, butter and cream. An aspic is jellied broth made from meat or fish stock. Gelatin powder or gelatin sheets are added to the stock so the aspic will hold its shape after it is unmolded—the stock itself doesn’t contain enough gelatin. Aspic is refrigerated, where it becomes solid like gelatin; then is cubed and used as a relish for meat, fish or vegetable dishes; or it is used as to filler a mold that holds meat, fish or vegetables. Bouillon is a clear, thin broth made typically by simmering chicken or beef in water with seasonings. It can be consumed in this state, or used as a base for other dishes, sauces, etc. Bouillon can be made from mixed sources, e.g. chicken and vegetables. Bouillon (not to be confused with bouillon cubes) is a stock that is strained then served as a clear soup. It can be enhanced with other flavors; for example, sherry, herbs and spices. Aspic isn’t soup, but it’s made from soup—specifically, stock. 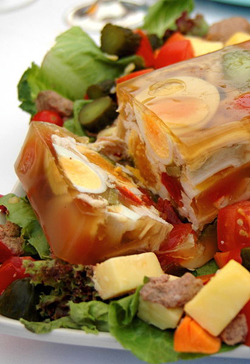 Here, chicken aspic cloaks chicken meat, eggs and vegetables. Photo by Anthony Georgeff | Wikimedia Commons. 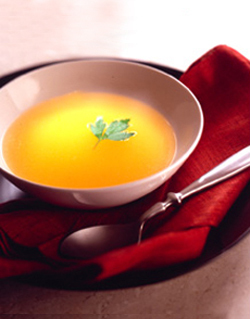 The terms bouillon and broth are used interchangeably: a thin soup is made from a clear stock foundation. One way to distinguish them is that a bouillon is always served plain (with an optional garnish), whereas broth can be made more substantive with the addition of a grain (corn, barley, rice) and vegetables. A consommé is a refined broth. Meat or fish broth is clarified; this is usually done with egg whites. Egg whites, tempered with some of the broth, are added to the soup pot. As the whites solidify in the hot soup, they gather up all the floating bits of meat, vegetable, etc. The “raft” of egg whites that results is removed, leaving a clear soup. This is a much more efficient process than straining the soup several times—and the raft, essentially poached egg whites, can be eaten by the cook. Gelatin filtration is much easier for home cooks, but results in a gelatin-free broth. The gelatin that remains after egg white filtration has a much richer mouthfeel. The richest, thickest chicken soup of all: a broth thickened with eggs, butter and cream. Velouté, meaning velvety, is the adjectival form of the French word for velvet, velour. A broad description for any of the soup types above. It generally refers to chicken broth made with vegetables, especially carrots, celery and onions, and is often served with noodles. Stock is a liquid in which bones (or shells, in the case of seafood stock) and vegetables have been boiled. Any part of the animal that is not desired for eating can be used—feet, head, neck, etc. The bones contribute gelatin to the liquid, as well as flavor. Higher-gelatin stocks make a better base for sauces. The difference between a stock and a broth is the seasoning. Stock is not seasoned; it is an unfinished product that is an ingredient in another dish. * That’s the difference between stock and broth. Bouillon cubes are often used in recipes, instead of a stock prepared from scratch. But like any quick fix, the flavor of instant bouillon cubes can’t compare to a reduced stock. Premade stocks can be purchased at retail, some better (more flavorful) than others. Our favorite prepared stock is from Savory Choice. *Stock is used to make gravy, marinades, risotto, sauces and other soups. Beef stock is also used for au jus. Cream soups are made with a thin cream sauce (béchamel) and are highly nutritious because of the cream protein plus the meat and vegetables (or fish and/or grains). The creamiest of all soups is a velouté (see above). Food History: Many of today’s soups date back to the Middle Ages. A dessert consommé, boiled solely with tendons and cartilage and without salt, was sweetened, flavored with fruits and served as dessert. These sweetened consommés evolved into today’s gelatin desserts, such as JELL-O.